The recent announcement of the change of leadership at the helm of Microsoft has sparked speculation about possible strategic directional changes as well as kindled hopes that the pioneering company and its iconic founder who appeared to be floundering in recent years may well be getting their act together. 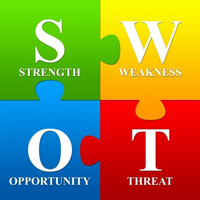 The ensuing SWOT Analysis places these strategic moves in perspective and appraises the situation, which the company finds itself in at the moment. The succeeding discussion must be viewed in the larger context of the match between the internal dynamics and the external business drivers that affect Microsoft in its quest to regain its market leadership. The biggest strength of Microsoft is that it has top of the mind brand recall among all the PC (personal computer) users in the world. Indeed, Microsoft and its legendary founder, Bill Gates, are known to anyone who is remotely acquainted with computing. This has enabled the company to forge ahead of its rivals even though as we shall discuss later, in recent years, some of the sheen of the Microsoft brand has been lost. The other strength and a key driver of its business and readymade acceptance by the users of its products is that Microsofts software is easy to use which has won it an increasing base of customers around the world. It can also be said that Microsoft and Bill Gates have spawned what can be called a Second Industrial Revolution by making computing available to the masses. The company has a worldwide network of distributors and also it indulges in co-branding with hardware makers of computers, which enables it to have strategic depth and a breadth of user base that is unparalleled. Microsoft has consistently beat analyst expectations in terms of profitability and revenues though it is appearing to be vulnerable to shifting trends like mobile computing in recent years. The biggest weakness of Microsoft is that its fabled team did not anticipate the emergence of the internet as a phenomenon that would take over the world in addition to reading the market signals about mobile computing. In case of the former (internet), Microsoft was slow to respond and even when it did, it was in a manner that attracted monopolistic charges which in earlier years were the mainstay of the company. As for mobile computing, Microsoft completely missed this wave and indeed, the success of the other computing revolutionary, Late Steve Jobs and his Apple Company appeared to blindside Microsoft and Bill Gates so much that it has even now failed to come up with a compelling Smartphone device or operating system. The third weakness relates to the ubiquitous security flaws in its software, which is apparent to any windows user, and chances are that you would have probably encountered the familiar crashes of Windows no matter which version you use. Though Microsoft failed to read the emergence of the internet and was completely taken aback by the mobile wave, a ray of hope that is still visible to the company is in the cloud-computing paradigm, which the company is betting big to take on the competition and regain its leadership position. Indeed, the recent appointment of the Indian born Satya Nadella as the CEO is in line with its aggressive push towards cloud computing as the game changer for the company and since Nadella is thought to be a cloud-computing wizard, it is understood that Microsoft is banking on him for it to ride the next wave. The company has a huge cash hoard which means that if it cannot grow organically (through normal growth) it can still grow inorganically (through acquisitions) of smaller companies that have good business prospects. This is the manner in which Bill Gates made amends for misreading the internet and bought out Hotmail created by another Indian, Sameer Bhatia that did give Microsoft some edge for a few years before Google revolutionized personal email products. As can be inferred from the analysis so far, Microsofts biggest threat is that its very size which is an asset otherwise is preventing it from being quick and nimble and seize market opportunities by proactively reading market signals. Further, Microsoft faces a key challenge from Open Source software, which was a force to reckon with initially seemed to have lost some of its fizz though it is making a comeback again. On the commercial front, Microsoft has been exasperated with software piracy especially in Asia where the pirated copies are more than the original products in China and India. Finally, Microsoft has to be both weary and wary of potential lawsuits especially in Europe where the regulators are not taking kindly to its monopolistic business practices. The preceding analysis has made it clear that Microsoft cannot afford to misread emerging trends and changing customer preferences anymore. Instead, it must be in a position where it senses and intuits market moves and prepares to act accordingly. A possible strategic move would be to focus more on the enterprise segment since most other technology companies seem to be focusing exclusively on the personal customer segment. In conclusion, it remains to be seen as to how the recent leadership changes play themselves out with regards to the future strategic moves by the company.